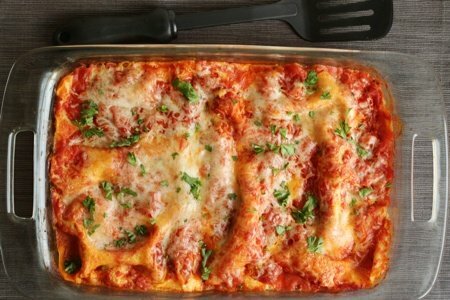 Lasagna is one of those foods that top favorite foods lists. My son, not unlike Garfield, hasn’t met a lasagna he doesn’t like. When I went to work on Snack Girl to the Rescue!, I knew it was time to update my lasagna recipe –but what to do? My first idea was to drop the noodles and use zucchini instead since it is much lower in carbohydrates and calories. Oh darn!!! I am going to be traveling to Atlanta but will be there the weekend of Halloween. Wish you were there that Saturday! I would have blown off the Saturday leg of my conference to attend your class and to meet you. That would have been fantastic! Hi Snack Girl...love your site! Have been working on a healthier lasagna myself and have stumbled across replacing the ricotta with plain Greek yogurt. The trick is to strain the yogurt. I line a strainer with cheesecloth and let it sit over a bowl. Plus the liquid remaining can be used as whey when making smoothies or added as any liquid when cooking or baking! Thanks for all of your great recipes and insights! Does anyone know how many calories are in each WW Points Plus? I know the old point system was around 50 per point. I'm fairly certain I can try this with eggplant too. Thanks for the idea! Thanks for this laz, recipe but can I use regular cooked laz noodles ? @Kathleen - yes, you can cook them and then put them in the lasagna - the cooking time remains the same. I want to reach through the screen and grab a bite! Hi Beverly. There aren't any calories in the PointsPlus formula. PointsPlus are determined by fat, fiber, protein, and carbs. Wow, it looks so delicious. Yum! Must try making one myself!